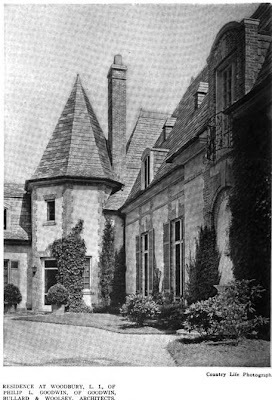 'Goodwin Place', the estate of Philip Lippincott Goodwin designed by himself c. 1917 in Woodbury. 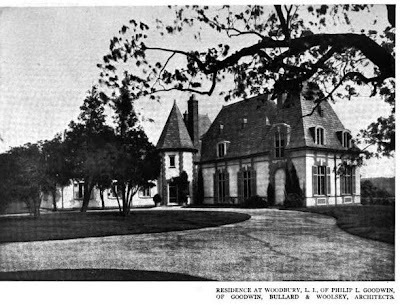 Goodwin was a partner in the architectural firm of Goodwin, Bullard & Woolsey and at one time vice chairman of the Museum of Modern Art in NYC. Goodwin, along with Edward Durell Stone, designed the MoMA building in 1939 in the International Style. 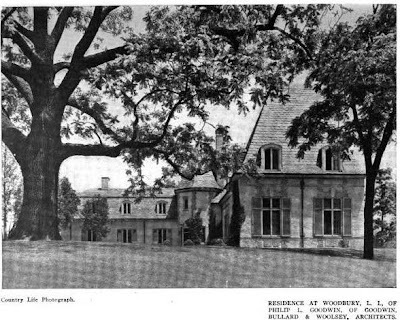 The house was purchased in 1969 by the Highland Academy but was demolished in 1975 to make way for development. Click HERE to see where 'Goodwin Place' would have stood on google earth. Click below to see 'Goodwin Place' intact and still standing in an 1953 aerial shot. 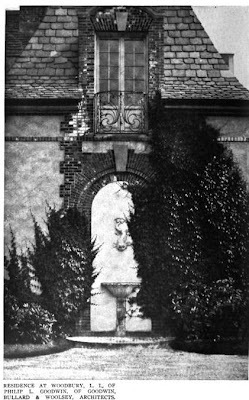 Pictures from Architectural Record, 1920.
wow - what a beautiful place. houses designed by architects for themselves are always so much more interesting than the ones they do for money (fallingwater notwithstanding). that minimalist fountain built into the side of the house is to die for. well, it almost made it. any interiors? 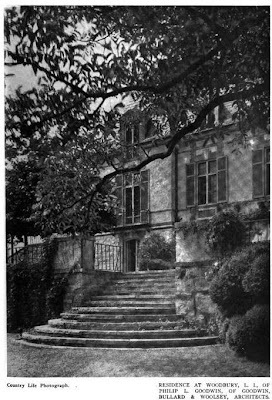 In 1925 Goodwin co-wrote a book entitled 'French Provincial Architecture', clearly a subject he was rather familiar with. Hello Zach, I'm always eager to learn whether the houses you're writing about are still standing, and hoping for good news. Some aren't memorable, but this one is a great loss. What a lovely, charming house. Heartbreaking! 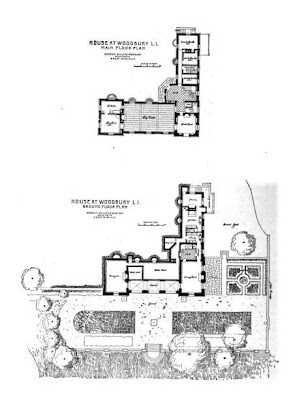 Indeed, a particularly lovely house, and always wonderful to see how architects who were later excellent, early, practitioners of modernism were also earlier particularly adept at historical styles---George Howe is another good example. Shame it was torn down. Very liveable floor plan..
Quite the loss! Thank you for sharing the fascinating info with us! Zach -This house brings back many wonderful memories. When I was younger, lucky enough to go to some great parties at the above mentioned Noble Judah estate which was built in the 20's. Goodwin's own house was a bit smaller but the eye for detail and careful planning that makes the Judah house so spectacular are evident here. Those are some great links to the Judah house. 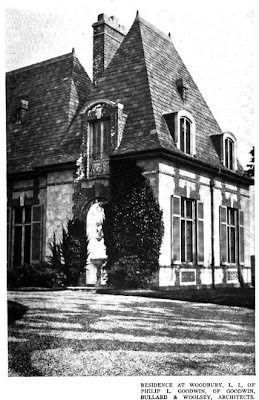 In the black & white picture, the three arched windows on the ground floor lead to the indoor pool. Above are two suite of guest rooms with the balcony. The color picture shows the entrance side. This coor leads from a huge court yard and then there is another courtyard inside which is slightly visible here. 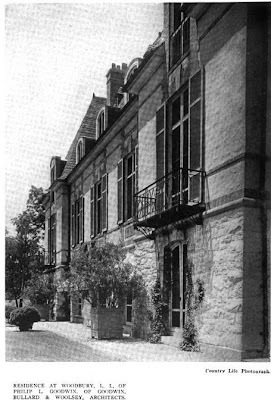 There used to be several large trees in the interior courtyard. Perfection! Mignon perfection! Lovely size, lovely scale, lovely presentation. - I witnessed a fire at Goodwin Place from a distance on Woodbury Road one afternoon in 1975. Smoldering at a slow rate, the local engine company taking no time, deploying every tool in their arsenal, the fire was snuffed out in minutes, as was Goodwin Place although its fate had long since been sealed. Only cold, wet charcoal fragments in small heaps lay on floors in rooms left roofless, but they, the fire brigade, seemed quite satisfied with the wreck they left. I understand much better now just why firefighters need to do certain things. At the time I may have been age 9, and believed, erroneously, they should be preservation minded too, ah well. I watched Goodwin Place decline from near perfect preservation to a vandalized wreck, and it was heartbreaking. It was seldom occupied in the late 1960s-the current owner was "abroad"; possibly in Italy. It was a delightful playground for a respectful youngster. the Belgian block forecourt- all combined to form a surreal, nearly deserted wonderland by day, but it was even better on a nighttime foray. Goodwin Place is gone now, one more victim of time and of "progress".